I put the camera down and pulled out my phone to snap this photo using Instagram. 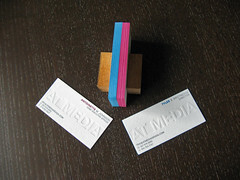 We’re happy to finally be posting these business cards we printed for At Media, a philadelphia based branding agency. They designed the cards and did a great job mixing color and texture, especially in the use of the blind patterns used on each side. 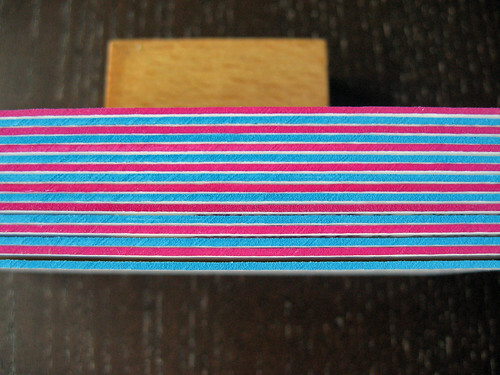 We also edge colored the cards in magenta and cyan to match the ink color used for Tyler’s and Antoinette’s cards. These cards use a similar effect for the blind pattern like we used for the 259 Strategies cards. The actual text is knocked out of a background of straight lines. 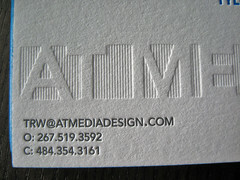 The lines in this blind design are vertical, which interact with the light differently depending on how you hold the card, it makes for a neat effect. 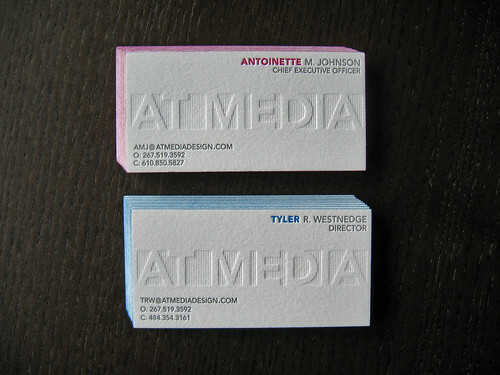 The layout for Tyler and Antoinette was the same except we swapped out ink colors, cyan and magenta were swapped on the front and back of the cards. 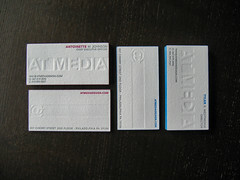 The cards were letterpress printed in three colors on both sides: blind, medium gray, and cyan/magenta. Below are photos of each card from the same perspective. We love the mix of cyan and magenta! This last photo is great because you can see how the light interacts with the print. The photo above-left has light coming from the left and the the photo above-right has light coming from the bottom. Here are photos of the press sheets prior to duplexing and cutting. 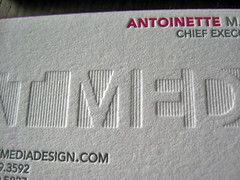 The first photo shows the front of the cards, we printed tyler’s and antoinette’s cards together on the same sheet. This ensured consistency for the gray and blind impressions. 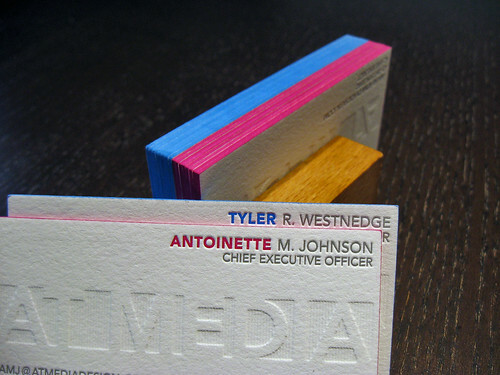 This photo (above) shows the press sheet for the back of the cards, again with the respective colors for Tyler and Antoinette. The At Media logo (a modified @ symbol) shows up nicely in the blind pattern. Because of the heavy impression on either side of the card, we printed each side on a separate sheet of 110# fluorescent white Lettra. 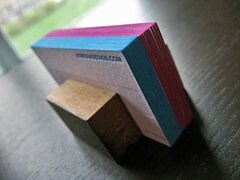 After printing, we duplexed the cards to create the final 220lb stock. 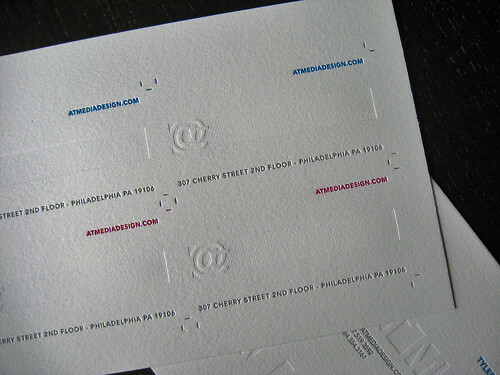 Duplexing here also eliminates any bruising that would normally show up with a double sided letterpress card. And now for some gratuitous photos of the edge coloring! 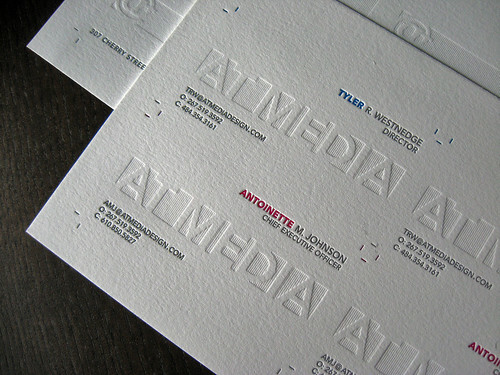 Just like the letterpress parts, we paired Tyler’s and Antoinette’s cards with a matching edge color. 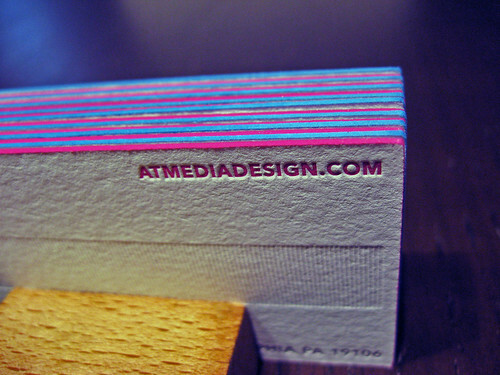 The cyan and magenta edges really pop on these cards. I’ll never get tired of photographing business cards like these! Ok seriously these are the last set of photos we did. We were very happy with how everything turned out. If you’ve got questions about the production of these cards post it in the comments below. 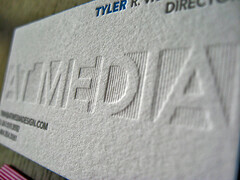 For inquiries and quotes on letterpress business cards, email us (contact@dolcepress.com) for more information.